The Joy of Sox’s new storage facility in King of Prussia, PA. The Joy of Sox is a nonprofit that provides joy to the homeless by giving them new socks. The Joy of Sox® recently consolidated all its inventory of new socks into one location in King of Prussia, PA. The nonprofit, who gives new socks to the homeless, needed the additional space to store their sock donations and the boxes of socks that volunteers put together ready for distribution to shelters. Last year The Joy of Sox donated 33,484 new pairs of socks to the homeless. 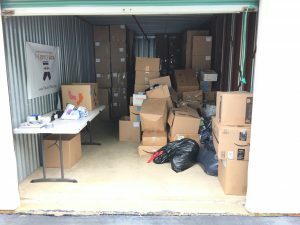 This year they project donating over 40,000 pairs . The Joy of Sox® is a Philadelphia-based 501(c )(3) nonprofit with the mission of giving joy to the homeless by giving them new socks. Their vision is to be able to give several pairs of new socks to every homeless person in the United States several times a year. Founded in 2010 they have given over 220,000 pairs of new socks to the homeless in 30 states and four countries. For more information please visit www.TheJoyOfSox.org.